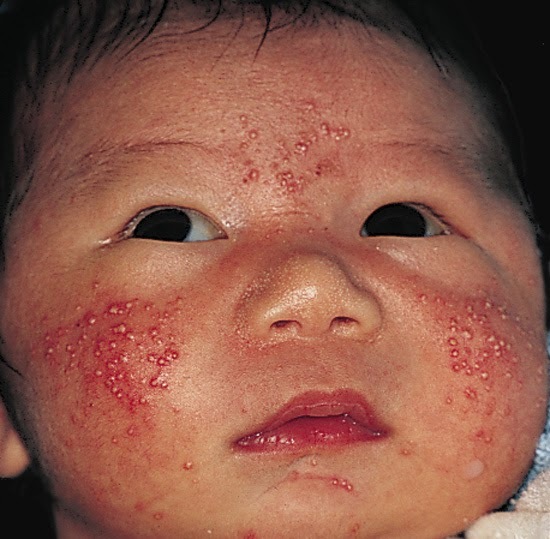 Neonatal acne is a common problem in newborns that manifests during the first month of life. Usually, it does not need treatment, solving it by itself .. 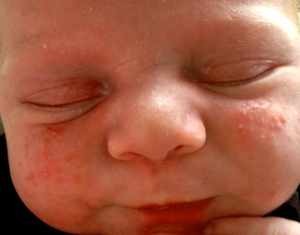 The neonatal acne or acne newborn emerges, as the name implies after the baby is born. It manifests itself during the first month of life and in most cases does not require treatment. Acne does not just appear in teenagers and adults. This problem also affects about 30% of newborns. Acne is a skin reaction that is characterized by the appearance of black or white spots, pustules and oily skin. When the hair follicle becomes infected, it protrudes and appears red. 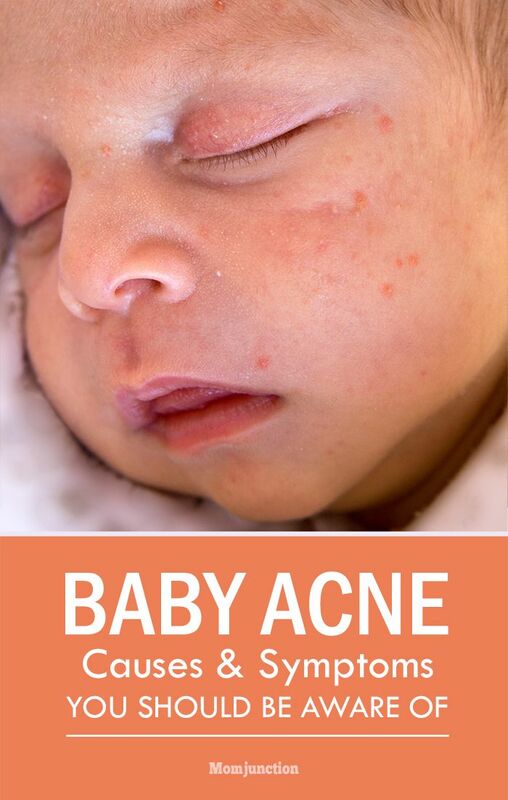 Usually neonatal acne appears on the baby’s face, but it can also appear on the chest and back. 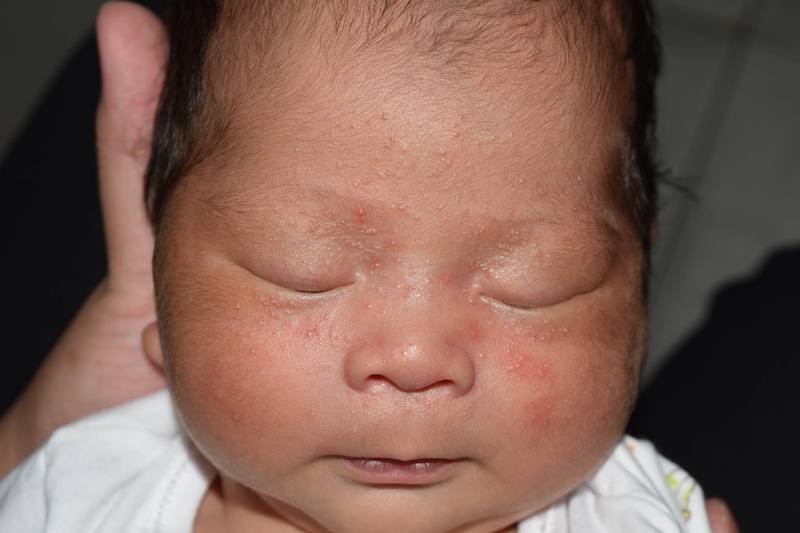 The reason for the appearance of neonatal acne is not known, but it appears to be related to the transfer of hormones from the mother to the baby. This transfer of hormones occurs during gestation, breastfeeding and postpartum. 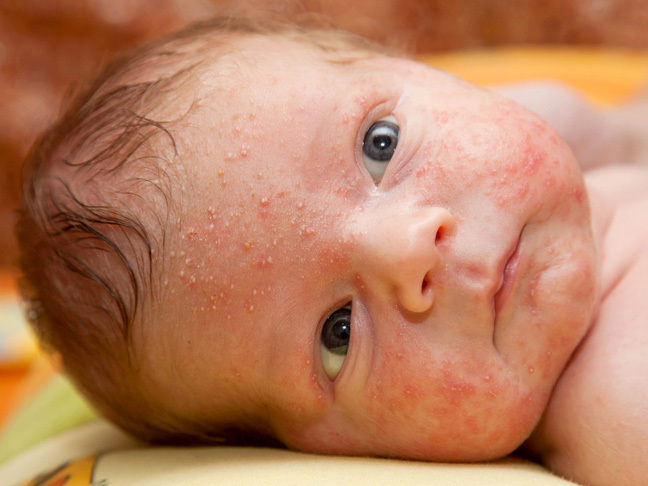 As hormones fade from the baby’s bloodstream, acne will fade by itself. 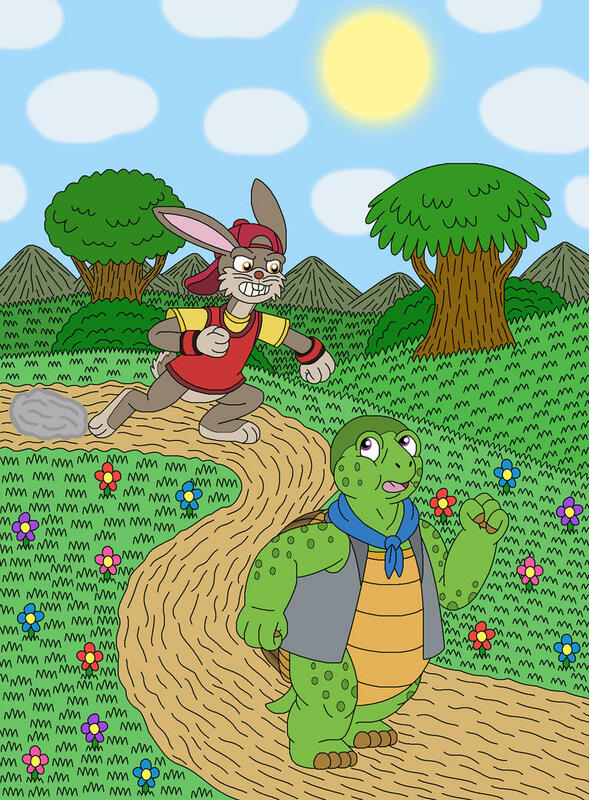 Adaptation to the extrauterine environment also seems to trigger toxic reactions in the baby’s skin, such as neonatal acne. 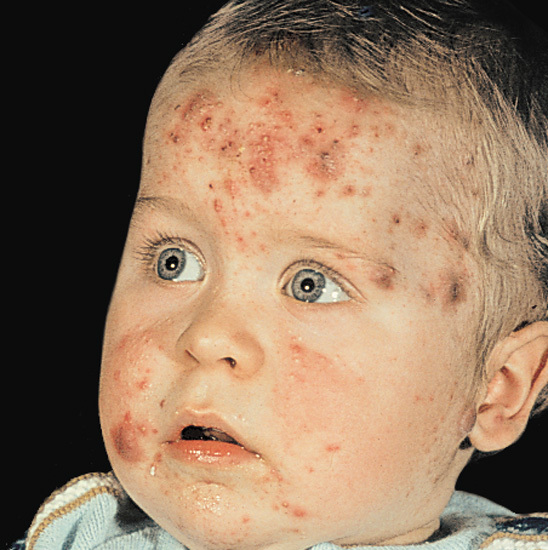 HOW TO TREAT AND WHEN TO SEE A PEDIATRICIAN OR DERMATOLOGIST? In the vast majority of cases, no specific treatment is necessary because the skin eventually recovers and the acne disappears completely until the baby is 6 months old. If you think you should intervene to help with the treatment, first consult your pediatrician. Do not squeeze any of the lesions under the risk of being able to ignite them, making the situation worse and even causing irreversible damage to your baby’s skin. There are times when you should see your doctor (pediatrician or dermatologist) to see if medical intervention is needed. One of the cases is if blisters appear with fluid or many pimples with pus, either on the face or any other part of the body. Bubbles with liquid can be a sign of viral herpes. 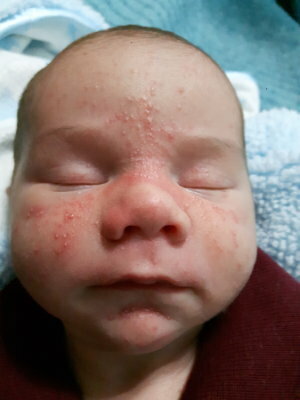 Because the baby is newborn, his immune system is still immature, which contributes to the development of a viral infection, which may require medical intervention. 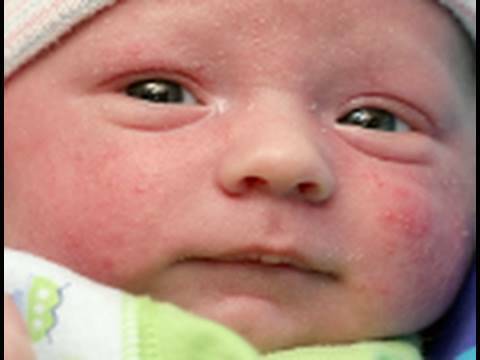 HOW TO KEEP BABY’S SKIN AS GOOD AS POSSIBLE? In order to keep your baby’s skin as good as possible he should wash it daily. This should be done with water and neutral pH soap suitable for the baby’s skin. This rinse should only occur once a day. Never use products suitable for adults on your baby’s skin . Products targeting adults are almost wholly more aggressive than baby products. Using products directed to adults can damage the baby’s skin, worsening his condition and may even leave permanent lesions. Do not squeeze any of the lesions as they will only make the situation worse and do not use oils or oily products (the aim is for the infected zone to be as clean as possible, free from grease). Do not rub the infected area and be very careful when drying it . Only touch the towel in several areas to dry, thus avoid rubbing the skin. Try to be as careful and delicate as possible because rubbing the infected area will make the situation worse and hurt your baby. Dry the affected area whenever possible , as humidity contributes to the appearance of more lesions. 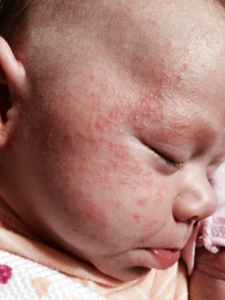 If your baby is very uncomfortable with itching and irritation talk to your pediatrician before trying treatments. You should therefore keep your baby’s skin clean and dry without ever rubbing the affected area. In the vast majority of cases you just have to be patient. Your baby’s immune system should treat the rest. Your Biggest Questions about Makeup Answered!